Being on a healthy eating plan can mean that you feel like you can't go out for meals, I know lots of people who will actively avoid eating out because they are on a 'diet'. In my opinion the best way to succeed at losing weight/becoming more healthy is to look at the change in what you're eating as a new way of life which you'll be following for the foreseeable future so you need to know how to live as well as lose weight. Throughout my time at Slimming World I have eaten in various different places, don't get me wrong some places are better than others but there will always be a 'healthy' choice and the key is not to be scared to ask for something without a dressing or to have something in place of chips. I know that in a lot of places it's VERY hard not to choose the biggest cheesiest burger or the most calorific pizza you've ever seen but I can tell you from experience that when you choose the healthy choice you leave without an ounce of guilt and with quite a smug little smile on you face. To be totally honest none of the starters here really float my boat, I usually just go straight in with the main course but nevertheless if I was forced to choose a starter I'd probably go for the mixed olives because although they're probably covered in oil, they're the best of a bad bunch really. This one is easy for me, I'd definitely go for the chicken butterfly because although there is a bit of skin on it there's nowhere near as much as there is on the other chicken 'parts'. As for sides you could go for spicy rice, corn on the cob and/or a side salad, the only thing I'd say is don't slather butter all over your corn - sprinkle some salt on and it tastes just the same. The mash and macho peas might sound like a healthier option but the mash is loaded with butter to make it creamy and tasty and the macho peas contain quite a bit of oil from what I've heard. I might also treat myself to a slice of halloumi and count it as my Healthy A choice (slimming world talk!) but I usually just go for the butterfly, spicy rice and side salad. I would suggest that you can use the peri peri sauces pretty freely because they're not creamy or anything like that so shouldn't contain too many calories so crack on with those if hot stuff is your kinda thing. The frozen yoghurt is definitely the lesser of the many naughty but nice desserts on the list; I would imagine that it's full fat yoghurt but that's better than a calorie loaded chocolate cake! 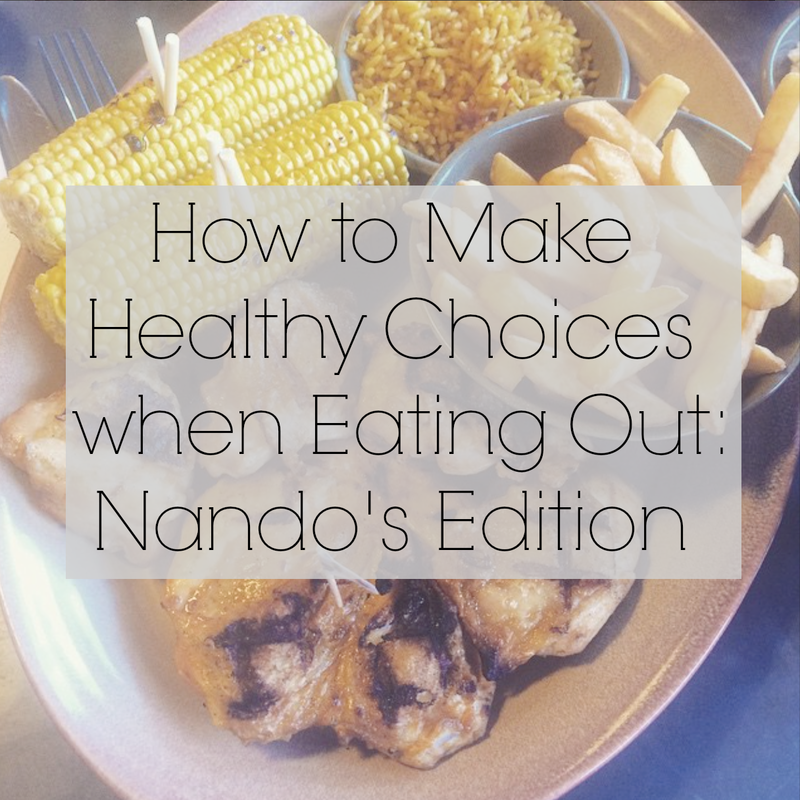 So that's my first little guide to eating out and making healthy choices. If you have any restaurant/eating place suggestions then please tell me in the comments!